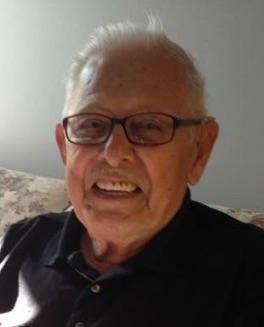 Frank H. Martinez, 90, formerly of Fremont, OH passed away on Wednesday, December 6, 2017 at the home of his daughter in North Muskegon, MI. He was born on July 7, 1927 in Pharr, TX to Francisco and Dolores (Hernandez) Martinez. Frank married Dolores Yanez on December 7, 1952 in Mexico City, Mexico and she preceded him in death on July 22, 2002. He worked for American Shipbuilding Company and then for Great Lakes Sugar Company where he retired in 1992. Frank was a member of Boilermakers Local 85 for over thirty years. He was a member of St. Ann Catholic Church. He enjoyed carpentry, gardening and spending time with his family. Frank is survived by his children, Ana M. (Don) Elder, North Muskegon, MI, Rudy Y. (Linda) Martinez, Toledo, OH, Mary E. (T.J.) Held, Perrysburg, OH, Frank Y. Martinez, Atlanta, GA; sisters, Hortencia Renteria and Carolina Martinez both of Mercedes, TX; thirteen grandchildren and nineteen great grandchildren. He was preceded in death by his parents; wife, Dolores Y. Martinez; son, Art Y. Martinez; two brothers and seven sisters. Mass of Christian Burial will take place on Wednesday, December 13, 2017, 10:00 am at St. Ann Catholic Church, 1021 W. State St., Fremont, OH with Fr. Michael Roemmele officiating. Burial will be at St. Joseph Cemetery, Fremont. I am so sorry to hear about the passing of your Father, know I have your entire family in my thoughts and prayers. I pray God holds your hearts as long as you need during this difficult time. He will always be with you, keep your memories close to your hearts. as time will ease your pain. Ana and Don, so sorry for your loss. I had not heard this so it came as a surprise to me. God bless you in your time of mourning. On behalf Ismael, Freddy, Becky and myself (Gilbert) I wish to express our condolence for your lost of your father Frank. He was the last uncle of us on the Martinez side of our family. RIP Uncle Pancho as we all knew him in Texas. Ana, Rudy, Frank and Mary sorry for your lost. God bless you all. My Condolences we just found out of Tio Pancho passing. Even though we’re miles away we always think about our TIO. HE was a very fun loving person to be with Loved all the stories he would tell us of his childhood with his sister’ s and my very witty grandma Elvira. I was just planning a family reunion with Tia Tencha the other day.I keep in touch with my Tias. You have Family here in South Texas when ever you Familia Martinez want to visit. 956- 246- 7820. Elvira PIÑA was sister to Tio Pancho. I was very close to Elvira and I only have My Tias . That s my # whenever you want to call.